A voter/citizen of the USA expressed that he is aware that this election is a train wreck but wants to be able to say “at least I tried”. If you are in a sinking boat because it was poorly constructed, to say you tried to save it by using a small bucket to dunk the water instead of a huge one, still doesn’t stop the boat from sinking. It’s time for a new boat! The American voter is in a codependent relationship with an abusive government. 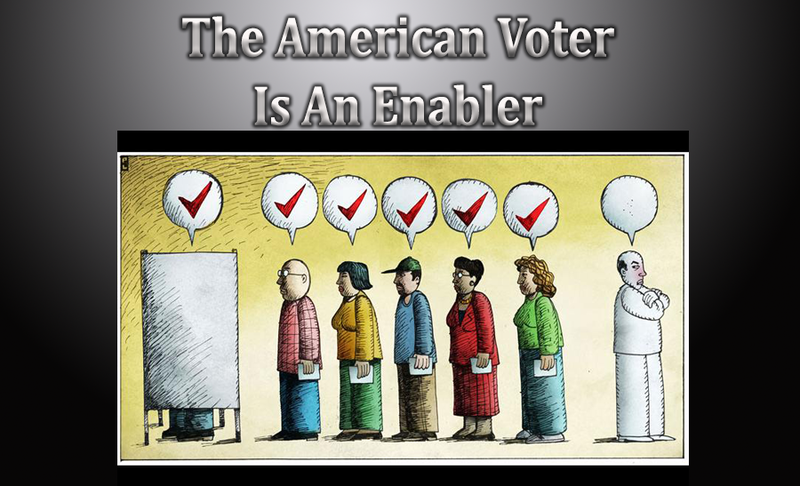 The American voter is an enabler to its abuser because he/she believes by trying to win the game by the government ‘s rules that they will eventually be given Justice and/or correct treatment. They refuse to see that their government is a Psychopathic tyrant who cares only to be fed by its host. They cannot accept that all their trying will make not a shred of difference because the relationship is not dependent on the tyrant being removed. But only the reformation of the Tyrant. As long as the American voter believes that the tyrant can be reformed, they will continue to try to save the sinking ship with whatever size bucket they have. It’s time to abandon ship, and build a completely different model that can truly sail the seven seas!